I use my RPi2 as a network drive to access music/movies and save backups via SMB. 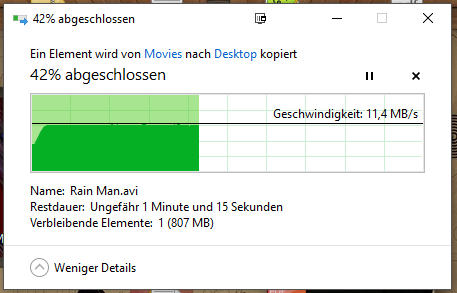 Since the Rpi2 with 100Mbit-Lan and USB2 speed is very limited, for me therefore counts every bit/s. With Raspbian and other distributions i always get a network speed of about 11-12MB/s(read/write) over SMB, with xbian however only 8-9MB/s(read) and 4-5MB/s(write). -i testet the Speed with a fresh isntalled Xbian on a sandisk ultra 32GB SD Card. -With my USB stick (ext4) the speeds ar minimally higher, but the ratio are the same. -PC and RPi2 connectet via Lan with my Gbit-Router (Unitmedian) an Cat6 cable. -PC: I5 with Gbit-Lan and SSD (Windows 10). I tried to reproduce your issue but having no issue here. Getting always read/write speed of 11.2MB/s +/- 0.3MB/s, but I do not have Windows for testing, samba share was mounted by my Cubieboard2 (1GHz dualcore ARM v7 powered) home server (100MBit/s network). Tested ext4 and ntfs fs, ntfs is a bit slower than ext4, but only marginal. So my question, how do you mount your external disk? Make sure that you do not use sync and use big_writes option when mounting external drive. But i can´t find any option to enable big_writes, can you tell me how i can enable this option? i´ve checked the file /etc/usbmount/usbmount.conf, and as you say big_writes option is enabled for ntfs. So this does not seem to be my problem with the lower networkspeed, i now got 8-9MB/s for read/write. Strage that you have the same speed with Xbian as I get with other distributions (11-12MB/s). Do you still have any idea why it could be? (my Xbian is freshly installed and no other things installed or added in Kodi). but the transmission values change only minimal. (27th Oct, 2016 01:11 AM)Harald654 Wrote: Do you still have any idea why it could be? (my Xbian is freshly installed and no other things installed or added in Kodi). Now I was just reconfiguring my notebook a bit (connected to GBit switch instead of WLAN) and started my pretty old W7/32bit in VMware workstation. Did you already test raw read/write speed from/to external disk? I meant system (XBian) is on different SD card different HW gives different results? i also test it with my old laptop with Win7, but still the same speed. 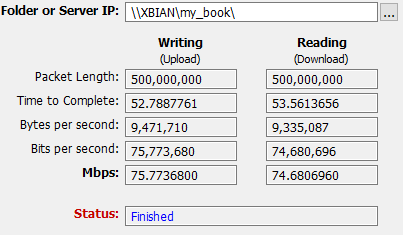 I installed quickly Xbina on the SD card wich i used for the test with OSMC, but still get the same speed of 8-9MB/s. i cant follow you, what did you mean? "media/MyBook"? But i have good (and strange) news! # need to add some additional shares see smb-shares.conf below for a simpler way to do this. # the default shares or global options. If you need full control see smb-local.conf above. Current time: 26th Apr, 2019, 12:05 AM Powered By MyBB, © 2002-2019 MyBB Group.